Jean-Marc Bosman is a Belgian footballer who proved that in today's complex legal climate, not only the most outstandingly gifted players are capable of hoisting their names into the headlines virtually every day. In the case of Bosman, the headlines invariably spelled bad news for the football community at large, although of course many individuals, especially players nearing the end of their contract, were not unhappy. The ruling of the European Court of Justice in December 1995 upheld the case brought by Jean-Marc Bosman against the European football authorities as a result of his failed transfer from a Belgian to a French club in 1990. The repercussions spread quickly through western European football as the European Union demanded that regulations concerning players' transfers and limitations on foreign players be amended almost immediately. The inflexibility of the ruling and the urgency of the deadline, in mid-season, amply illustrated the EU's total disregard, and indeed its total disdain, for the realities of football competition. In the many months while the storm-clouds of the Bosman ruling had been gathering on the horizon, FIFA had played a deliberately low-key role, as the issue was one which essentially affected only the 18 national associations of the member states of the EU. Clearly the statutory provisions for almost 200 national associations worldwide could not be radically altered because of legislation affecting less than ten per-cent of this membership. The dossier remained with FIFA's confederation partner, UEFA, and was therefore in experienced hands, especially as UEFA had maintained an on-going dialogue with the EU for the better part of the previous two decades and had successfully achieved special dispensation for the needs of football. The storm has now broken and brought with it from Brussels a fresh wind of intolerance. FIFA has been obliged to add its own weight to withstand the blast, which has threatened to blow away much of the foundation on which the sport is built, in Europe and potentially also elsewhere. The well-known saying maintains that it is an ill wind that blows no good, however, and the challenge of the years ahead will be to rescue from the remains of the Bosman Affair those pieces which can be used to build a new and lasting world football order. Jean-Marc Bosman gets into a quarrel with his Belgian club, FC Liege. They reduce his salary by 60%. Bosman wanted to transfer to the French club Dunkirk but his current club wanted a huge transfer fee. Finally, FC Liege dropped Bosman. Bosman sues for damages against FC Liege and the Belgian Football Association. 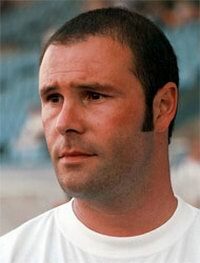 A Belgian court permits Bosman to transfer to the French club free of charge. The Belgian Football Association appeals. The Court of Appeal decides that Bosman has the right to transfer. Bosman returns to Belgium and his application for unemployment benefit is rejected. The appeal to UEFA (United European Football Association) by FC Liege and the Belgian Football Association fails. Bosman claims 1 million dollar damages at the EU-tribunal in Luxembourg. UEFA issues an open protest letter in favour of Bosman. FIFA (International Federation of Football Association) supports UEFA. Bosman wins his case at the EU-tribunal. No further appeals are possible.